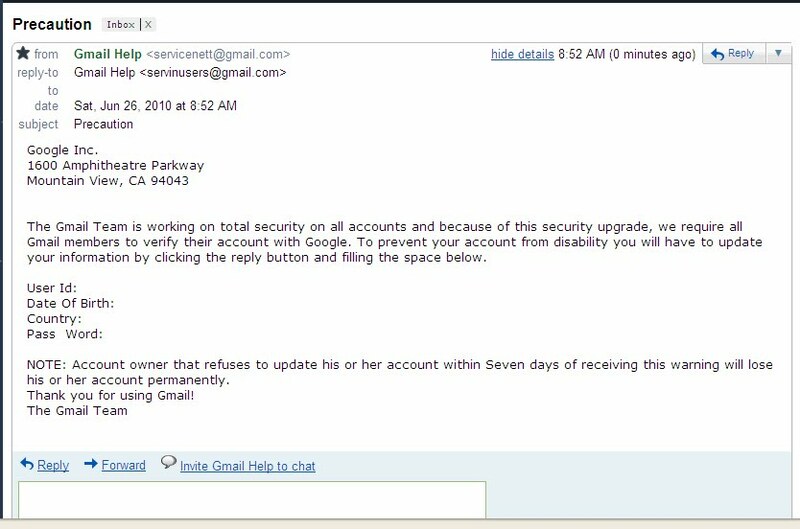 To make it look real, it listed Google, Inc. and the address (which can be found on Google) and proceeded to request for the user's ID, Birthdate, Country and, get this, your Password. Doh! 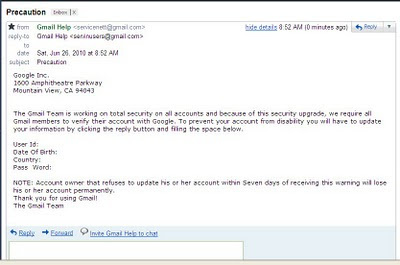 It follows through with a threat of consequence of non compliance.. "Comply in 7 days or you will lose your account... PERMANENTLY!" Lol! Well, the weird thing about it is, it was not captured by Gmail Spam. They should maybe reconfigure their spam tracker to be able to capture these posers too. Anyway, to anyone who will receive this, please don't fall for this stupid sh*t.
I received several similar emails too from PayPal. Very genuine looking emails with my name on them, but it's a lesson I have learned. and never click the links that come with those emails.